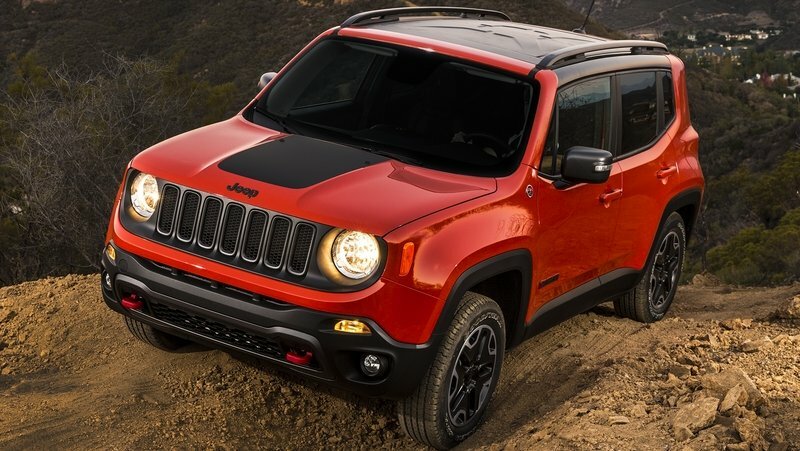 Renegade may be made in Italy and is more cute than rugged with rounded edges and chunky panels, but it still deserves to wear the Jeep badge. 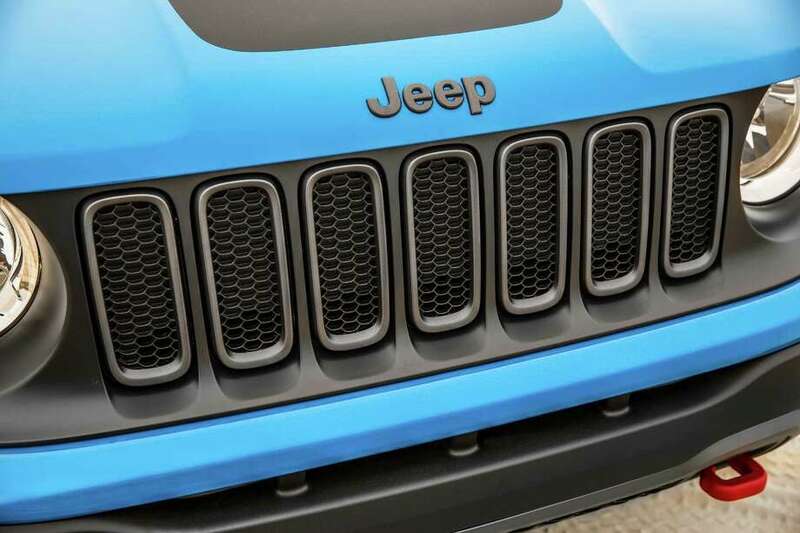 The signature seven-slot grille and round headlamps are all iconic Jeep. And it can be rigged for far tougher off-road adventures than competitors, including its cousin, Fiat 500X. This is year two for the playful-looking Renegade with about 114,000 sold through June 2016. The numbers are on the rise, matching Jeep’s Compass and closing in on Patriot but still well behind the rugged Wrangler and larger Cherokee and Grand Cherokee. The biggest change for the current model year is the availability of a Beats (a division of Apple) premium audio system. Rain-sensing windshield wipers also now are available. Prices start at $18,990, same as last year. That gets you a front-wheel drive Sport model with a 1.4-liter, 160-horsepower 4-cylinder turbo engine. Add $1,280 to move into the 2.4-liter, 180-horse 4 with a 9-speed automatic. The turbo does best on fuel economy rated at 27 miles per gallon in combined driving, but that’s using premium gas. The 2.4-liter is rated at 25 using regular. Inside you get a nice mix of soft-touch materials, solid construction and chunky grips and such tying into Renegade’s exterior look. Front buckets are comfortable with roomy surrounds, but the back is not very hospitable for anyone with long legs. The payload floor has a hidden compartment, or you can remove the top for a deeper storage well. Rear seats as well as the front passenger seat flip forward on all but the 2WD Sport. You can find small crossovers that run a little less than the Renegade, but its price is fair. But there are a lot of tempting options to send that sticker soaring. Start with basic 4-wheel drive for about two grand or the Dawn of Justice (Batman v. Superman) special edition that starts just over 27K. A cool feature on my bright yellow tester was the $1,495 My Sky roof system with two panels that either tilt up at the touch of a button or can be removed entirely. Roadside and emergency help are available at the touch of a button, HD radio, voice texting and a large 7-inch screen are among Uconnect infotainment options. Safety gear ranges from blind-spot monitoring to a parking aid and rear cross-traffic alert. There are a ton of choices when it comes to small crossovers. Renegade’s ride and drive are more harsh than most and it’s not as powerful or fuel efficient as many rivals. But if you want to hit the trail, or just want a rig that’s youthful and fun in the sun – snow and mud too – then this little Jeep is a top choice. I had a friend who drove a soft-top Jeep Wrangler TJ all across the country all through our itinerant 20s. Loud, unruly, inefficient and mindlessly fun, it was a perfect symbol for the wayward post-college years. A decade or three removed, I thought of that Wrangler while driving the Jeep Renegade, which is smarter, safer, and more secure in its direction. The grille, headlights and boxy style are all Wrangler-inspired, and the tester’s bright Omaha Orange color was a nod to the 1976 CJ5. 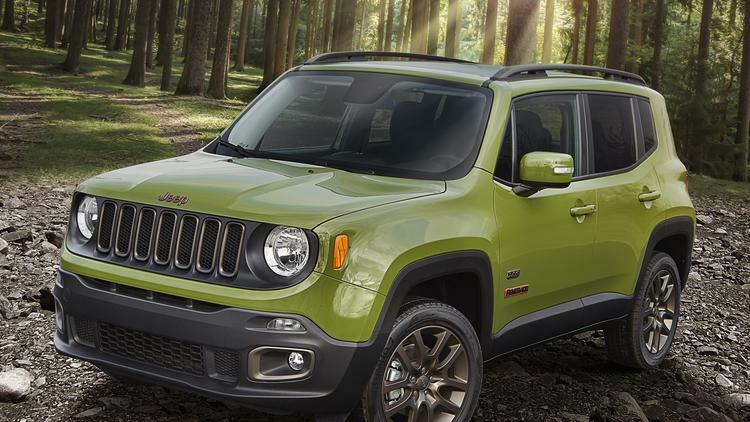 Renegade is a more refined Jeep, more versatile than rugged, yet it’s still a hill of fun. Renegade was launched for model year 2015 on the crest of a wave of subcompact crossovers landing in the North American market. The Trailhawk-rated version is the only cute ute with any legitimate off-road capability. Most importantly, this global-market vehicle feels and looks like a Jeep, even without all the kitschy brand heritage reminders, from the grille-shaped speakers to the shovel-shaped grab handle and the X-ed out taillights. In steep, muddy, and rocky courses at Road America in Elkhart Lake, Wis., and the Autobahn Country Club in Joliet, Ill., the trail-rated Trailhawk was able to keep pace with the Wrangler, despite smaller wheels, arches and a shorter ground clearance of 8.7 inches, same as the Cherokee midsize SUV. It’s no Wrangler; it dips its small wheels in, more than plowing through, but the 4×4 gets the job done. There are five drive settings, including mud, snow, sand and rock in a dynamic four-wheel drive system Jeep calls Selec-Terrain. It can be used in normal road surfaces with snow or wet conditions to minimize spinouts and to start in second gear so the wheels won’t make a rut when taking off. The Active Drive 4×4 Low system specific to the Trailhawk models lets the Renegade crawl over rocks and other uneven terrain due to all sorts of engineering wizardry. The brake-lock differential, for example, stops one wheel from spinning and delivers all the torque in that axle to the wheel that is planted. So long, log blocking the road. Hill descent is another magical function that, once activated, will overtake the gas and brake pedals. It’s a leap of faith, especially teetering over a rocky descent, but so is any complex mechanics. The driver can brake if he feels the need to do something other than steer. The little buddy with the 2.4-liter Tigershark engine churns out 177 pound-feet of torque, and can tow up to 2,000 pounds, good enough to lug the ATV or Harley. It’ll also turn those two red tow hooks on the front, or the one on the rear, into a rescue device instead of just a cool visual component. The wizardry doesn’t stop once the Trailhawk is back on the road. Because it’s wiser than the Wrangler, the rear axle disconnects from the powertrain when it’s not needed. Sounds ominous but it’s a fuel saving device reverting the Renegade to a front-wheel drive vehicle that is more efficient, smoother and quieter. Paired to a nine-speed transmission that initially gave FCA all kinds of trouble in the Jeep Cherokee, the four-cylinder engine is good enough to deliver 24 mpg combined, which is one of the worst for a subcompact crossover but the best for a Jeep. Trade-offs are so adult. All this sophisticated mechanical capability means owners should be on good terms with a Jeep service center, who must be among the few who can fix problems should they arise. Keeping with Jeep’s manual, hands-on heritage, the tester came with twin removable roof panels known as My Sky. The two panels over both rows of seats are like lengthwise T-tops, except the safety engineers made sure it was a two-handed operation so fun-seekers ditching work wouldn’t be removing the panels while on their way to the beach. A key (best stowed in the glove box) unlocks the panel, then a latch pops it free. You could theoretically remove it from a seated position, but it’s best to stand on the door sill and remove it from the top. A padded storage bag in the back keeps the panels secure, though it does limit how much you can stuff in the small cargo area. The 60/40 rear seats provide plenty of space, and for solo adventurers the front passenger seat folds forward for stowing long boards and other gear. The easy-to-clean black cloth seats with red stitching also have a contour map of Moab, the off-road Mecca that Jeep celebrates annually with its Easter Safari. One last cute ute feature on the interior is the dual vents positioned like eyes above the backup camera. Many have called it WALL-E, the titular robot compactor that only Pixar could make cute, and you just may find yourself giving its `head’ a pet or two before leaving the vehicle. The Renegade Trailhawk is great for people who don’t need the regular ruggedness of a Wrangler, but who are still tempted to detour off the road well-traveled into the unknown. The Renegade makes perfect sense for Jeep at this juncture. Not only are compact SUVs and crossovers the current hot market, but the Wrangler has gotten huge in its iconic old age, and a large percentage of the Jeep true believers don’t take the compact Compass and Patriot seriously. With a powerful need to reinforce the Jeep badge, the company needs a vehicle that embodies its strengths. In that mission, the Renegade is not subtle. In addition to resurrecting a nameplate from a 2008 concept truck and the Jeep CJ-7 before that, the smallest Jeep is a cheeky, boxy little thing that’s practically overflowing with classic Jeep styling hallmarks and designer Easter eggs. Though it’s a humble unibodied crossover, the Renegade sports off-road friendly dimensions and a Trailhawk model that, like its Cherokee Trailhawk counterpart, is capable of following its big brothers on the toughest Jeep Jamboree courses. The Renegade arrives with a healthy dose of attitude and real capability that set it apart from the rest of the rapidly growing compact-crossover herd. n spite of its square-rigged styling, the Renegade is one of the best-looking Jeep products to date. The tiny box has been trimmed and smoothed at the corners, and the round headlights and seven-slot grille seem to emerge naturally from the shape. The hood is contoured to resemble the classic tapered Jeep hood, and the large, square taillights are patterned like the fuel-toting jerry cans that were strapped to the back of many a military Jeep back in the day. In spite of its square-rigged styling, the Renegade is one of the best-looking Jeep products to date. A range of bright colors (including Omaha Orange and Solar Yellow) announces the Renegade’s presence cheerfully—but on the Trailhawk, shallower front and rear fascias, unique 17-inch wheels and bright red tow hooks are reminders that there’s some seriousness beneath the happy-commuter sheet metal. The wheels can be had in bright chrome or imposing black to further personalize the Renegade. Removable “MySky” roof panels are available to open up the Renegade to the sky. The Renegade’s interior quickly inspires games of Spot the Jeep Face: it’s embossed on the seats, displayed on the door speakers and rear-view mirror surround, and even inside the tailgate. Just in case you hadn’t forgotten, “SINCE 1941” is emblazoned on top of the center stack. The materials and design take inspiration from the Wrangler, with sports-equipment style fittings. Jeep calls the look “Tek-tonic,” and it adds to the rugged atmosphere that the tiniest Jeep exudes. Style and attitude aside, the Renegade’s cozy interior is very comfortable, with seats just the right height and plenty of headroom. The thick A-pillars may take some getting used to, but don’t block as much visibility as they seem to at first. The controls are easy to use and feel pickup truck-durable. As nice as the Renegade is, it resolutely feels like the sort of vehicle one wouldn’t be too upset about getting dirty, which is of course the point. A choice of five or six and a half-inch touchscreens provides information in the center stack as well as video from the reverse-assist camera. Options include heated front seats and a heated steering wheel. For 2016, Jeep has added rain-sensing wipers and the Beats Audio system upgrade to the options list. The nine-speaker Beats sound system adds a subwoofer and a 506-watt amp to the compact vehicle. Two engine and drivetrain choices are offered. The 1.4 liter MultiAir turbocharged four-cylinder is standard, and produces 160 horsepower. Higher-spec Renegades get the 2.4 liter “Tiger Tiger shark” 16-valve four-cylinder with variable valve lift timing. The bigger engine bumps horsepower to 180 and adds a standard nine-speed automatic transmission. A six-speed manual is available with the smaller MultiAir engine, and can’t be had with the towing package. The nine-speed gearbox comes off as a gimmick at first, but the wide selection of gear ratios does good things for fuel economy, and both Renegade powertrains can get over 30mpg. This requires a careful foot on the throttle: over the course of my week with the Renegade, my fuel economy rarely went much over 22mpg. The complicated transmission is not the greatest for performance; when pressed for quick downshifts, it responds with the rubbery feeling more reminiscent of a CVT. For steady-state freeway travel and most driving situations, the Renegade is delightfully civilized and it seems to combine many of the classic Wrangler’s abilities with day-to-day livability. It’ll even tow up to 2000 pounds, which is enough for a small utility or camping trailer. Frequency-damping Koni struts are used front and rear and result in surprising road holding. The Renegade has none of the tippy feeling that many small crossovers exhibit during cornering. The Renegade Trailhawk upgrades the powertrain with added suspension articulation and Jeep’s Active Drive Low four-wheel drive system, which offers the Jeep Selec-Terrain system that adapts the four-wheel drive to multiple surfaces, including sand, snow, rocks and mud. The Renegade’s four-wheel drive system is adapted from the Cherokee. It’s able to put nearly all of the engine’s power through one wheel, if needed to crawl out of a tight situation. To improve fuel economy, the rear axle can disengage completely when it’s not needed. The Renegade lives up to Jeep’s reputation for toughness, and the tiny sport-ute was awarded a four-star overall rating by NHTSA, with only a three-star rating in rollover crashes bringing the average down. The IIHS rates it “Average” to “Good” in all categories. Available safety equipment includes a rear park assist, a backup camera and the UConnect 9-1-1 Call assistance button. A lane departure warning system, forward collision warning and blind spot monitor are available. Jeep Jeep ’s also got the UConnect Access infotainment system, which offers emergency services at the touch of a button. The Renegade lineup starts with the Sport, moves up through Latitude and Limited models, and tops out with the Trailhawk. The Renegade Sport starts at $17,995 for two-wheel drive and $19,995 for four-wheel drive and includes the 1.4 liter engine. The $21,395 Latitude adds 4wd for $23,395. The Limited and Trailhawk are equipped with the 2.4 liter engine and nine-speed automatic. Pricing for the Limited is $25,120 for 2wd and $26,745 for 4wd, and the 4×4-only Trailhawk starts at $27,120. Effectively a Chevy Sonic on stilts, the Trax is a suburban-bred, pavement-friendly compact do-all. A multi-configurable interior’s combined with available all-wheel drive and a frugal 1.4 liter turbocharged engine to create an affordable jack-of-all-trades. MINI Countryman: The stylish Countryman looks like another of MINI’s fashion-first products, but if the brand’s recent desert rallying adventures are any indicator, there’s some real ability hiding beneath the skin. Though it’s a bit expensive, the Countryman features MINI’s signature styling, high safety ratings and even the nimble handling that the brand is known for. The HR-V will never be able to follow the Jeep Renegade off-road, but acquits itself on pavement quite well, thanks to extremely attractive pricing and a chassis shared with the Honda Honda Fit. All-wheel drive, a five-star crash rating and up to 35mpg on the freeway are pretty attractive qualities as well. The Renegade fulfils the promises made by the disappointing Compass and Patriot. This diminutive off-roader is a true Jeep in spite of its shared platform, showing off considerably more off-road ability than any of the compact SUVs it competes with while exuding giggle-inducing levels of Jeep attitude. Attractive pricing and pleasing road manners don’t hurt, either. Call this one a win. We’ve all seen the movies about our victorious men in WWII. The history is known now of course; the Americans and her Allies are triumphant over the evil Axis powers, sailors kiss the pretty girls in Times Square in celebration and everyone retires to suburbia. One constant we always see in photos and in those movies is the iconic little workhorse that carried the GIs to victory, the Willys MB Jeep. More than any other vehicle, save maybe the Pershing tank, the Jeep is the vehicle that is most often associated with our WWII exploits. Which is why we found it a little odd that the latest offering from Jeep is actually built in Italy; and why we found it somewhat ironic that we would get Jeep’s latest offering during the week we remembered V-J Day. That latest offering is the Renegade. It’s the smallest in the line, a mini-SUV with a quirky sort of look that fits in with the Kia Soul, Nissan Juke, and Mini Countryman. The Renegade can be had in four different trims, Sport (base MSRP $17,995), Latitude ($21,295), Limited ($24,795), and Trailhawk ($25,995). The Sport, Latitude, and Limited trim levels all have the Active Drive system available while Trailhawk models come standard with the Active Drive Low system that includes a 20 to 1 “crawl ratio”. With the four-wheel drive systems, you get the Selec-Terrain system controller with Auto, Snow, Sand, and Mud settings, and the Trailhawk adds a Rock mode. The Latitude and Limited are available as 4X2 or 4X4 models. The exterior look is a tall one, with an identifiable trademark grill, and protruding taillights with an X shape that Jeep says are based on the X stamped in the old 5-gallon Jerry cans carried on the back of the iconic Jeep from WWII. Overall, the Renegade looks like what it is, the little brother to the Wrangler. Inside the cabin is spacious and filled with what Jeep calls Easter eggs; Willys Jeep silhouettes seemingly all over the place including the speaker grills, and a topographical map of off-road Moab, Utah molded into the rubberized tray under the infotainment screen in the center console. Jeep calls this interior “Tek-Tonic”, and says the interior is “defined by the intersections of soft and tactile forms with rugged and functional details.” What it reminds us off however is the same vehicle the Renegade shares a platform with the Fiat 500L. That’s not a bad thing, we liked the 500L, we really did, and we like the Renegade; however, we felt as though we could have liked it a great deal more. Here’s why. Not only are 4X4 models available in the line, but there are such niceties that are options such as a “My Sky” removable roof panels along with a 7-in. color multiview TFT display, a 6.5-in. touchscreen, GPS navigation, SiriusXM Traffic, SiriusXM Travel Link, SiriusXM Radio, and HD Radio. Also available is LaneSense Lane Departure Warning-Plus, Rear Cross Path detection, and a driver’s seat with eight-way power adjust with two-way power lumbar adjust. We had none of that. We instead had a cloth ceiling overhead, manually adjusted seats, Uconnect 5.0 AM/FM with 5.0-in. touchscreen, SiriusXM Radio and Bluetooth and our tester was a 4X2; sorry no off road excursions for us. We found all this to be a bit odd, perhaps we have been spoiled through the years, but it seems that if a manufacturer wants an automotive writer to see the very best they have to offer, they should give us something that is the best they have to offer; put on your Sunday go-to-meeting clothes. That’s not to say we didn’t like the Renegade, it just seems that we saw only a sliver of what this new vehicle can be. There are two powerplants available, a 1.4-liter MultiAir Turbo engine delivering 160 horses with 184-lb.-ft of torque and the 2.4-liter Tigershark engine with 180 horsepower and 175 lb.-ft of torque. Power is delivered though a new nine-speed automatic transmission, or with six-speed manual transmission. You can guess what our tester had for the week; yup, the 1.4 liter with the six-speed manual. To us this seemed even more odd since in the 4X2 configuration the Renegade is best suited for city driving, something that can be a pain when manual shifting is involved. Like the Soul , 500L and Juke, the Renegade is being marketed to the younger generation and that can be evidenced in part to not only by the interior styling, but the six speakers and 180-watt amplifier sound system which sounds great and easily rivals those found in vehicles costing a great deal more. On the road the 160 horses were fine, the body roll was minimal and the shift points easy to find. Yes, the Renegade gets an impressive 31 highway, 24 city and 27 miles per gallon when combined, but with only a 12.7 fuel tank it seems as though you are filling it up as much as any other vehicle you drive. So what’s the point in having great fuel mileage if you can’t pass a gas station at least once a week? Overall though the Renegade is a fine vehicle. Despite the odd configuration we had, with the right set-up the little Renegade will appeal to those looking for such a thing. And with prices that can fit nearly any budget. At the end of the day we get it. As the world changed after WWII so too did American car manufacturers after the Great Recession in the mid-2000s. In order to survive alliances were formed and the once mighty Chrysler merged with Fiat to become FCA. That merger has worked out well for Jeep. In the last four years, Jeep went from selling 300,000 units in 2010 to over a million units in 2014. So who are we to knock that? After all, when all is said and done it’s all about selling vehicles, and after its rebirth that’s something FCA and Jeep are doing quite well, and with this latest offering , the Renegade, should do for some years to come. For those enthusiasts who relish the off-road capability of Jeep’s iconic Wrangler model offerings, but would prefer more sophistication in a style that’s less utilitarian, there’s a new kid in town — it’s the all-new 2015 Jeep Renegade that builds on and enhances the Wrangler’s bold athletic stance, rugged packaging and aggressive proportions, incorporating best-in-class approach and departure angles that were purposely designed to deliver the best capability in its class. The new Jeep Renegade is crafted and assembled in Melfi, Italy and features familiar key Jeep elements such as the signature seven-slot grille and accent colored “shield” surround. Traditional large circular headlamps are tucked just under the hood at the top for a more menacing look. Below the grille, a two-piece front fascia is aerodynamically tuned, featuring a body-color upper and molded-in-color lower for enhanced durability against the elements. Slipping inside, the new Renegade’s interior displays a rugged and energetic look and feel that builds upon the brand’s legendary heritage. It was designed using four key principles: make an emotional design impact; use high-quality materials with an inspired color and materials; integrate the latest state-of-the-art technologies; and develop clever storage and intelligent use of available space. Passenger seats are ergonomically designed to support body contours during longer journeys, and are trimmed with premium cloth or leather. 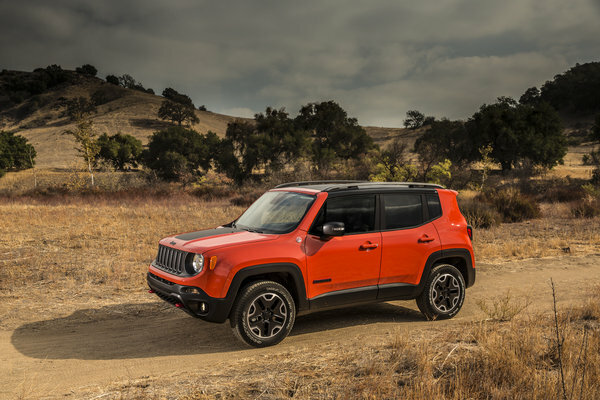 The 2015 Jeep Renegade will come in four levels of trim: Sport; Latitude and Limited, which are available in either a 4×2 or 4×4 drive configuration; and the off-road purposeful Trailhawk, which is only available as a 4×4. Open air freedom is supplied by two “My Sky” removable and stowable roof systems — one power and one manual. Power for the new Jeep Renegade will be supplied by either a 1.4-liter, SOHC, 16-valve, turbocharged, multiair, inline four cylinder engine with sequential, multiport, electronic, returnless fuel injection that produces 160 horsepower with 184 pound feet of torque (standard for Renegade Sport and Latitude); or, a 2.4-liter, SOHC, 16-valve, multiair2, Tigershark inline four cylinder motor with sequential, multiport, electronic, returnless fuel injection that delivers 180 horses while developing 175 pound feet of torque at 3,900 rpm (Standard for Limited and Trailhawk / Optional for Sport and Latitude). Transmissions will include a C635 six-speed manual, or the first 948TE nine-speed automatic transmission in the segment. Engines are transversely mounted up front, transferring motive force to the driving wheel configuration. SUMMARY: My driving partner and I initially thought the 2015 Jeep Renegade Trailhawk might be rough riding on the road due to its enhanced capability features, while its off-road prowess had yet to be put to the test, and remained questionable. We were dead wrong — the Jeep Renegade is more civilized on-road than the Wrangler and certainly more comfortable. Acceleration is great from the 2.4-liter motor, and the 9-speed auto gearbox operates smoothly. The ride quality is comfortable and quite stable. Seats are both comfortable and supportive, and the My Sky roof when open delivers nearly the same open-air experience as any Wrangler, which is fine off-road, but presents some serious buffeting while cruising at freeway speeds. There was a long trail with serious elevation changes that rated a 4 in difficulty as well as a specially prepared short course with rock crawling, log traversing and water wading that warranted a 6 rating. The Renegade conquered all with no negative issues or problems. Bottom line, the new Jeep Renegade Trailhawk is indeed a winner, both on and off road. It is the real deal — not necessarily as rugged as a Wrangler, but decidedly better looking. The Renegade is a really delightful small SUV that’s highly capable as well as affordable. The Jeep Renegade lives up to its name by bringing a rebellious new style to the compact CUV segment. Instead of taking a conventional approach, Jeep designers created a new design vocabulary for the Renegade that is defined by soft and tactile forms intersecting with rugged, functional details in a way that allows features such as a big passenger grab handle on the dash to not look out of place. There also are eye-catching shades of red, orange and bronze trim colors that we’ve never seen before in an interior. “The metallic bronze trim is stunning,” says editor Tom Murphy. Despite its nonconformist nature, the interior checks off all our scoresheet boxes in terms of being roomy, comfortable and having excellent ergonomics. And, unlike most of our 2015 test vehicles, the voice-activation system works flawlessly. But the attention given to interior details and design is truly spectacular for a vehicle in this class. WardsAuto tests a lot of vehicles where designers sweated over details, but we can’t recall an interior where they seemed to have so much fun obsessing. The Renegade makes you grin the minute you get behind the wheel. Instead of a standard red zone on the tachometer, there’s a paintball-like splatter. Aircraft-like “no step” signs are stamped on the running boards. “Since 1941” is embossed on the clamp surrounding the touchscreen, a slogan that proudly refers to Jeep’s long history of rugged individualism. The whole interior aesthetic “Conveys a sense of fun and suggests adventure,” says editor Jim Irwin. Numerous other whimsical design “Easter eggs” are scattered throughout the cabin, from outlines of the original 1941 Jeep’s iconic grille to topographical maps of famous off-roading sites embossed or etched on various surfaces. Their purpose is to surprise and delight, but also to connect drivers to Jeep’s rich brand heritage. DNA from Jeep siblings can be found everywhere: the grab handle that dominates the passenger side of the instrument panel clearly comes from the Wrangler branch of the family, while the stylish trim and high-quality materials seem related to the sophisticated older siblings, the Cherokee and Grand Cherokee. Which Jeep it is most closely related to probably depends on the trim level.